The venerable 24.3 metre motor yacht Antilles, listed for sale by Carlos Navarro at Bradford Marine Yacht Sales, has been sold in-house. Built in aluminium by US yard Burger Boat, Antilles was delivered in 1973 and accommodates four guests in two cabins consisting of a master suite and a twin, both with ample storage, entertainment centres and en-suite bathroom facilities. There are also quarters for four crew in two cabins. The main saloon is aft of the pilot house and has large windows to port and starboard allowing in ample daylight, and has two leather upholstered couches facing marble topped tables, a large china cabinet and a dining table seating six guests. A full sized bar is adjoined to the forward bulkhead, with a built-in sink, ice maker and a fridge. 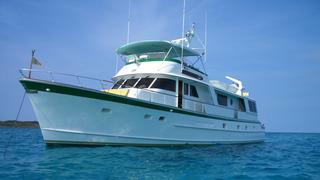 The aft deck is fully enclosed and air conditioned, featuring comfortable seating and two tables. The teak panelled pilothouse is positioned amidships for maximum comfort and has a built-in three person bench seat facing the fully equipped helm area and there is excellent visibility with windows to fore and aft and on both sides. Upstairs on the flybridge forward are two Pompanette helm chairs with additional L-shaped seating aft of the helm and to port, while a large Bimini top protects the entire seating area. Aft is the boat deck with two tenders and a pedestal mounted electric davit. Propulsion is courtesy of twin 525hp GM diesel engines. Lying in Florida, Antilles was asking $329,000.